The self-fulfilling prophecy describes how our expectations of others can lead them to act in a way that confirms those expectations. As leaders it’s time to reset our expectations so we can get the best out of our people and stop holding them back. Hello and welcome to episode 26 of the Leadership Today Podcast where each week we tackle one of today’s biggest leadership challenges. 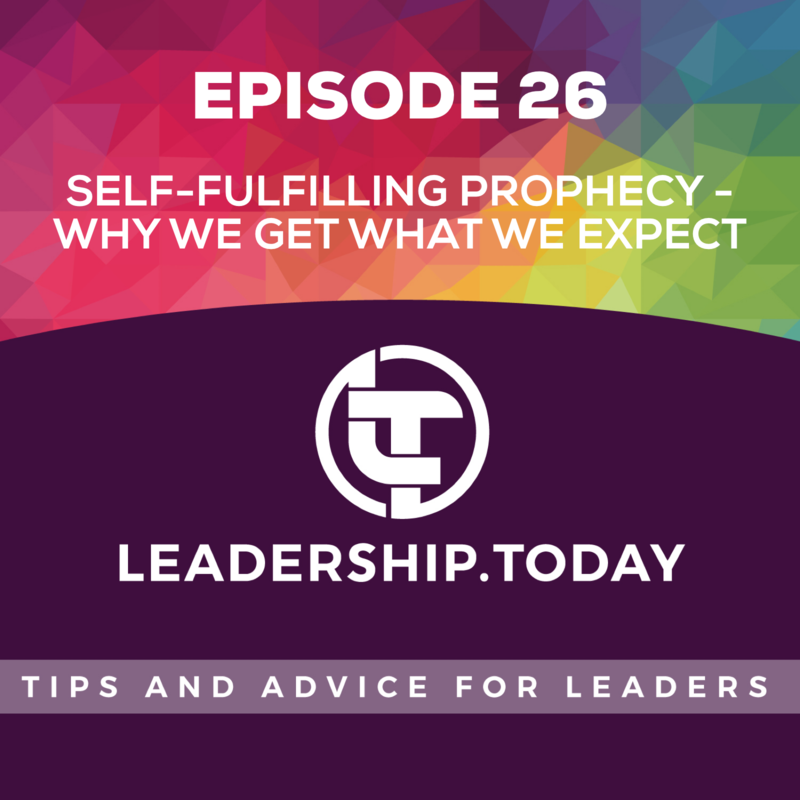 This week we’re looking at self-fulfilling prophecies, and why we get what we expect. It’s a sunny Wednesday in 1932 as the CEO of Last National Bank walks towards his desk. The bank is thriving and financially strong, and Cartright Millingville is rightly proud of the business he oversees. But as he continues past the tellers, he notices the queue of people lining up is much longer than usual - nothing to worry about at this point, but certainly different to most Wednesday mornings. As he takes a seat at this desk the noise and activity in the bank gradually grows, with people becoming increasingly unruly. And that’s because this is no ordinary day - hundreds of people are lining up to withdraw all of their funds from the bank, having heard a rumour of the bank’s imminent collapse. Despite the bank’s strong financial position, it could not survive the initially false, but ultimately true, perception that it might be at risk. The bank collapsed and closed its doors permanently the same day. The false perception became fact. The sociologist Robert Merton shares this example in his classic 1948 paper - The Self-Fulfilling Prophecy. In the paper he describes how our expectations can influence the world around us. Thinking that a financial institution is at risk of collapse can ultimately lead to its collapse. In the same way, our expectations of others can lead them to behave in line with these expectations. Merton defines the self-fulfilling prophecy as “a false definition of the situation evoking a new behaviour which makes the originally false conception come true.” And, of course, this outcome strengthens the original perception of the situation, as Merton continues “for the prophet will cite the actual course of events as proof that he was right from the very beginning”. A common example of a self-fulfilling prophecy is the placebo effect. In drug trials, prospective new medications are put up against placebo pills. These placebo pills have no direct physical impact on the individual. But believing that a placebo tablet will have an impact is often enough for it to actually have that impact. For that reason, finding drugs that work better than placebos can be difficult. It’s not that a placebo is neutral - the expectation the person has of the placebo tablet actually makes that outcome more likely. More recent research demonstrates that the placebo effect is so strong, it can still work even when the person knows that they’re taking a placebo. By way of example, Dr Ted Kaptchuk treated patients with irritable bowel syndrome by giving them a tablet openly identified to the patient as a placebo. This group demonstrated significant improvement in their symptoms compared to a group that didn’t receive a placebo. As Dr Kaptchuck notes, this clearly can’t work for all medical issues. However he sees the greatest potential for so called ‘open-label’ placebo treatments in conditions that are largely measured through self-observation - conditions including pain, nausea and fatigue. Placebo tablets and treatments are a great example of the self-fulfilling prophecy. Classic experiments in schools have also shown the impact of the self-fulfilling prophecy. In the 1960s, Rosenthal and Jacobsen undertook a series of experiments with teachers and students. In one experiment, they chose a group of students at random and told teachers that those children had taken a test which showed they were “growth spurters” - that they had high potential and were likely to experience great progress in the year to come. The children weren’t aware of this finding - only the teachers knew. But the group was actually not special - they hadn’t taken a test and had no reason to advance more quickly than their peers. At the end of the year the evidence was in - the students identified as “growth spurters” to the teachers demonstrated significantly greater improvement across the year than their peers. Believing a student had greater potential led them to demonstrate greater potential. This research has been replicated many times and while some more recent research has questioned the size of the effect, the effect is still there. So how does this work? It’s believed teachers’ expectations impact the way they treat their students and this, in turn, changes the behaviour of the students, helping them to reach those expectations. If I think a student has high potential, I’ll treat them differently, by giving them more opportunities to develop and demonstrate this potential. Research has found this same effect alive and well in our organisations too, where supervisor expectations can modify performance. Which raises another point - having low expectations can also lead people to reduced performance. As a leader, findings like these should make us pause and think: What expectations do I have of my people? What evidence do I have for these expectations? Are my expectations limiting the performance and potential of my people? What if we wiped the slate clean as leaders and expected more out of our people? What impact might that have? What if we expect that people turn up to work wanting to do a good job. That people can and want to develop and improve. That if the conditions are right, people can deliver even more than what we expect of them. While we’re at it, what expectations do we have of ourselves? Are there limiting beliefs you have about yourself that lead people to treat you differently? Perhaps you don’t expect to get a promotion, and this leads others to see you as less worthy of a promotion. Perhaps you joke about being lazy, which leads others to see you as lazy. You might take some time this week to consider your strengths. One way to do this is to take a survey like the VIA Character Strengths which can help identify your unique strengths. Embracing your strengths will help you to present more confidently to others, and change the way they view you in line with the expectations you place on yourself. Let me know how you go, and have a great week. Eden, D. (1984). Self-fulfilling prophecy as a management tool: Harnessing Pygmalion. The Academy of Management Review, 9(1), 64-73. Summary The problem with solving problems is that we often rush towards solutions without spending enough time clearly identifying the challenge we’re facing. In this episode we explore the power of a well crafted problem statement. 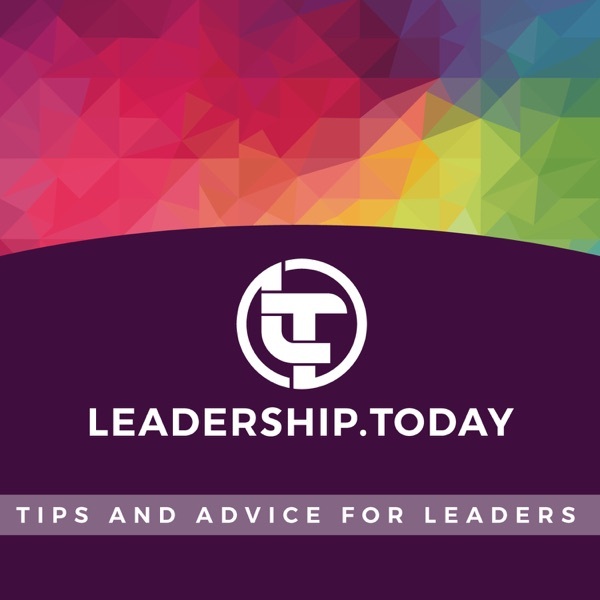 Transcript Welcome to episode 33 of the Leadership Today Podcast where each week we tackle one of today’s biggest leadership challenges. This week we are looking at the problem with solving problems - that we often rush towards solutions without spending enough time clearly identifying the challenge we’re facing. There’s a quote typically attributed to Albert Einstein that goes along the lines of “If I had only one hour to save the world, I would spend fifty-five minutes defining the problem, and only five minutes finding the solution.” Now, there’s not great evidence that Einstein ever uttered those words, but there is still a great deal of truth in them. We often rush into solution mode when we’ve only partially, or even incorrectly, identified the problem we’re trying to solve. I’ve spent around half of my career working in management consulting focusing on complex problems and solutions. Over that time I lost count of the number of times I heard the classic attempted put down - “consultants borrow your watch to tell you the time, then charge you for it”. Of course, if you ask a consultant to tell you the time while you’re wearing a watch, then maybe the consultant isn’t the problem. Either way, it highlights that organisations often outsource solution generation, and are then frustrated when the expensive solutions don’t quite hit the mark. I believe this is often because the problem isn’t clearly and accurately identified, so people end up frantically working towards solving the wrong problem. Once the problem is clear, organisations are usually pretty good at developing and implementing solutions. I shared an example in the last episode of a person who inherited a task to prepare a series of reports. Preparing all of these reports was arduous and took 8 hours to complete - it was a real problem for him as he struggled to get the rest of his work completed in the rest of the week. He initially identified the problem as “these reports take too long to complete”, and so came up with and implemented improvements that meant he could prepare the reports in just four hours. But there was a deeper question that needed answering - “why are these reports needed?” It turned out people weren’t actually using the reports - no one really needed the reports to be generated, and so he took an eight hour task and reduced it to zero. The problem to explore was around the need for the reports, not the efficiency of report production. It’s hard to identify the real problem when you’re in the middle of it, but using a clear structure and approach can help. It might even save you from using a consultant or, at least, make your investment in an external consultant more valuable. We need to start by trying to identify the root cause of the problem. I’ve talked about using the “5 whys” approach in episode 20 - repeatedly asking the question “why?” to step back towards the root cause. Once we think we’re close to the root cause, a structured problem statement can help. It provides some rigour around identifying the problem and its impact, while also making it easier to communicate the problem to others, and assess the value of various proposed solutions. One simple structure for a problem statement includes four elements: Ideal scenario – what it would be like if this problem didn’t exist Current situation – what it is currently like - the current reality Consequences – the implications for this audience if we do nothing - can help build momentum towards change Focus – the areas we will explore to solve the problem Here’s an example of applying that approach to a business that’s struggling to have sufficient stock in stores. Ideal - We want our customers to be able to easily purchase our products with an emphasis on experience and convenience. Current - Our most loyal customers are complaining that their local stores are often out of stock of our most popular products, so they’re forced to phone ahead or drive around to other stores looking for stock. Consequences - We are losing sales and frustrating our customers, leaving ourselves open to them switching to competitor products. Focus - To address this problem, we are going to explore three elements. The first being the reliability of transport of product from our warehouse to stores. The second - building our capacity to track current stock levels at stores. And thirdly, explore our ability to provide stock to customers directly via a new home delivery channel. Now it’s important to also be responsive. Sometimes as we are seeking to solve the problem, we come across further information which may further clarify the problem. You can always refine the problem statement to reflect this new information. Summary In this episode we look at ways to retrain our own worst critic - the automatic limiting thoughts that enter our minds when we are faced with challenges, and that hold us back from opportunities. 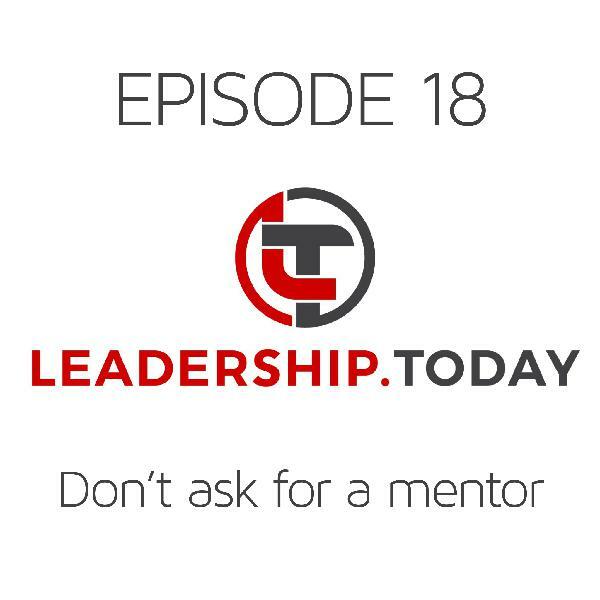 Transcript Hello and welcome to episode 31 of the Leadership Today Podcast where each week we tackle one of today’s biggest leadership challenges. This week we are looking at ways to retrain our own worst critic - the automatic limiting thoughts that enter our minds when we are faced with challenges, and that hold us back from opportunities. Have you ever had someone in your life that was continually negative and critical? Always chipping away, complaining, pointing out faults, highlighting risks? Did they hold you back from thinking more positively, from trying new things, from taking action? If you did have someone in your life like that, you probably either pointed out those tendencies to them, or simply spent more time with positive people. For many people, the most negative and critical voice in their life is the one inside their head - those automatic limiting thoughts that enter our conscious mind when we’re faced with a challenge or hit with a set back. The thoughts are automatic because they arrive without any conscious effort. And they are limiting because they hold us back from the potential positives of taking a different course of action. The human brain works really hard to join dots - to discover patterns and meaning behind the wealth of information constantly rushing in from outside and from within ourselves. The thoughts that enter our conscious mind are ideas providing one possible explanation for what we’re interpreting. As we saw in the self-fulfilling prophecy episode, these thoughts and beliefs can be so powerful that they actually shape events and people around us. If we think someone doesn’t like us, we can act in a way that will lead that person to like us less. And so the limiting thought is reinforced and strengthened. The human brain is also a risk management machine - we’re wired to notice threats. While you hear this sentence, your brain is scanning the environment for threats multiple times. This feature of our brain can also exaggerate the risk of taking action, leading us to magnify the risks and minimise the potential rewards. That’s why most people will work much harder to avoid losing a dollar than to gain an extra dollar. We are often working out of a mindset of risk and potential loss. I was recently coaching a person who was very nervous about public presentations. In fact they said “If I have to give a presentation to the rest of the team, I will die”. Now, on one level, “I will die” was just a turn of phrase. But, on another level, it was actually how they physically responded to upcoming presentations. They thought, felt and acted like there was an imminent threat to their life which, of course, there wasn’t. I worked with them to challenge and then change their interpretation of presentations. First we started by challenging the automatic thought. How did the team respond to other presentations in the past? It turns out they were usually quite supportive. Then we considered some alternative explanations. Perhaps they felt physically worked up about the presentation because they wanted to do a good job and it mattered to them. Then we simply changed the script - choosing an alternate thought that they were excited about the presentation. When you’re excited your heart rate might increase, you might get a little sweaty, you might even stumble over some words. But excitement is much more positive than nervousness. It’s the same physiology, but a very different mindset. Having your heart race made sense as an indicator of excitement - they didn’t need to interpret it as a warning sign. In fact, presentations could actually be a great opportunity to practice and improve their public speaking. So the presentation to the team became an exciting opportunity, instead of a life threatening risk. Retraining your own worst critic initially takes conscious effort, but over time we can create new and more positive automatic thoughts. The only way to get more comfortable and confident with public speaking is to do lots of public speaking. The new mindset, that presentations are an exciting opportunity to get better at presenting, encouraged them to do more presentations. Here are some ways to tackle our limiting thoughts, and retrain our inner critic: Notice your automatic thoughts. Write them down in a journal or using a notes app on your phone. That will give you a sense of what you’re telling yourself through the day. See thoughts as opinions, not facts. Assess whether each automatic thought is rational, true and helpful. Incorporate other information. Craft other potential explanations. Try to identify the most likely explanation. Avoid catastrophic language - “I’ll just die”, “this always happens to me”, “I’ll never get any better at this”. This just escalates the impact of the negative thought. Play the scenario out - realise that, even if the worst case comes true, you’ll still be okay. Rewrite the script - just like I did with the person I was coaching, changing “nervous” to “excited”. We can change the interpretation we place on our automatic thoughts and the cues from our body. By applying these approaches we can retrain our own worst critic to become much more focused on positive opportunities than paralysed by risks. Summary How do leaders create an environment where people thrive? This week we look at the importance of leadership styles in helping to bring out the best in our people. Transcript Hello and welcome to episode 28 of the Leadership Today Podcast where each week we tackle one of today’s biggest leadership challenges. This week we’re looking at how leaders create an environment where people thrive, which is building on some of the themes from last week’s episode. When I was 15 my first part time job was at a large retailer. My job title was ‘Customer Service Security’, which sounds pretty impressive, but in practice that meant I was the person who checked bags as people left the store to make sure they hadn’t stolen anything. At that time the retailer had a garden department with its own street entrance, so it wasn’t uncommon for people to come in the main entrance, steal something, then try to make a quick escape through the garden department. Of course they had to get past Customer Service Security first. By any measure, this wasn’t a great job to give to a 15 year old, but it was character building if nothing else. Another of my responsibilities was to help people who were returning goods, checking their receipts and passing them through to a person who could give them a refund. There’s one refund that has stuck in my mind 30 years after the event. A man came into the garden department one Saturday morning carrying what looked like a stick with a black plastic bag on one end. He let me know that he wanted a full cash refund on the item. I looked at the receipt, and what he had originally purchased a full three months earlier was a bare-rooted lemon tree. You see occasionally had specials where we would sell a bunch of young trees with minimal soil around the roots which were then sealed in a plastic bag - which made it much easier than shipping and selling them than putting them in pots. But this guy had bought the bare-rooted lemon tree, taken it home and put it in his garage for a full three months - no sunlight, no water, no nutrients, no space to grow. It didn’t take a horticultural qualification to realise the lemon tree was dead. Amazingly, our generous refund policy meant the man left with a full refund, and we were left wondering what to do with a dead stick in a bag. There are a few important leadership principles wrapped up in this story. The most obvious one is that, as leaders, we need to create an environment where people can thrive. Just like the lemon tree needed to be planted in good soil, with access to sunlight, water and nutrients to thrive, as leaders we need to provide an environment where people can thrive. I’ll talk more about how we can do that shortly. The second equally important principle is that we can’t force people to be motivated and to grow - that comes from within the person themselves. As leaders it’s important to recognise that we can’t directly motivate anyone to do anything. The closest we can get is through demands and threats, which is unfortunately what all too many leaders default to. While that might lead to a short-term lift in performance driven by fear, ultimately the impact is negative on the individual and the organisation. Instead what we’re aiming for is aligned motivation. If someone shows up at your workplace, they’re motivated. As a leader our role is to uncover what specifically motivates that individual, and to help align that with the direction and needs of the organisation. We do that by creating the right environment. In summary - the person owns the motivation, and the leader owns the environment that helps to align that motivation. So how do leaders shape the environment? We shape the environment through the leadership behaviours we demonstrate - the actions we take that build the kind of environment where people can thrive. The concept of leadership styles is not new - the styles I refer to are informed by over 80 years of research by people including Kurt Lewin, Fred Fiedler, Martin Evans, Robert House, James McGregor Burns, Bernard Bass, Paul Hersey and Ken Blanchard. There are four sets of leadership behaviours or leadership styles that are particularly helpful in building a positive environment. The first leadership style is Inspiring. This involves developing a compelling vision for the work that we undertake, communicating that vision, and aligning roles and individuals to the vision. This helps to increase clarity, and it also encourages alignment. People know where we are headed, they know their role, and they can connect their own motivations with that broader purpose. This is like sunlight for the lemon tree - providing energy and a direction to grow. My own research with over 1,000 leaders demonstrated that having a feeling you’re contributing to something meaningful reduced negative stress by 31%, and increased engagement by 74%. It even increased an individual’s likelihood of staying with the organisation by a full 87%. The second leadership style is Developing. Here we’re discussing the skills and capabilities people want to develop, coaching people, providing stretch opportunities, and investing in their development. This ensures people are developing their capability, while we’re also building the capacity of the organisation. This is like watering the lemon tree - encouraging its development. Here my research saw more significant results. Where people felt they were developing in areas important to them, their stress was 26% lower, engagement was up by 60% and again the likelihood of staying was up by 87%. The third leadership style is Connecting. This is where we help connect people with others that can provide support, while we also identify opportunities to work across the organisation, build teamwork, and provide direct support and encouragement. This style helps ensure people have the support they need, while also building collaboration for the organisation. This is like adding nutrients to give that extra boost to the lemon tree. Where people felt their job provided the chance to make meaningful connections, my research showed a 22% reduction in negative stress, with engagement up 57% and likelihood of staying up 68%. The fourth style is Delegating. Here we delegate important work to people, even when it may mean a short term dip in performance. We focus more on accountabilities and outcomes, giving people greater freedom about how they produce results. This provides the individual with authority, while also enabling us to hold them accountable. It’s like giving the lemon tree extra room to grow - putting it in a larger pot, or planting it with plenty of space to spread out. Again my research showed that providing people with autonomy and freedom has a significant impact, with negative work-related stress down 20%, engagement up 52% and likelihood of staying up 55%. There are two other styles that also influence the work environment, but not always in a positive way. Directing is about telling people how to do their work, closely monitoring people, and emphasising the negative consequences of getting things wrong. There are some times when this leadership style is appropriate - it provides task clarity and control. But it does this at the cost of autonomy and personal responsibility. This one is a bit like yelling at the lemon tree - it might make you feel better, but the tree won’t take much notice. The final leadership style is Avoiding. As the name suggests, this is where a person avoids the role of being leader altogether, keeping tasks to themselves, focusing on their own job, and avoiding delegating to people who have let them down. While the individual may be productive, team productivity is likely to be low. It looks a lot like the guy who left the lemon tree in his garage so he could focus on other things. Perhaps that worked well for him, but it didn’t turn out too well for the lemon tree. The really good news is that, like any other behaviour, leadership styles can be developed. A great way to start is to assess your own leadership styles. I’ve developed a great card-sort exercise which I use on leadership programs that helps people to identify their preferred styles. And I also have a Leadership Styles Self-Assessment which I’m providing as a free gift for those who sign up for Leadership Today updates. Just head to the leadership.today website, and sign up on the Connect page and I’ll send you a link. If you’ve already signed up, have no fear - I’ll be emailing you a link shortly. I’ll be interested in how you find the assessment, and I’ll be looking forward to seeing you next week. Summary Learning new things can be painful. Understand why that’s the case can help us, both as learners and leaders, to become more effective. This week we look at a framework to help us understand the predictable stages of learning, and what that requires from us as leaders. Transcript Welcome to episode 24 of the Leadership Today Podcast where each week we tackle one of today’s biggest leadership challenges. When’s the last time you learned something new? How did that feel? The workplace is changing rapidly, which means as leaders we are often needing to try things that we haven’t tried before. But learning something new can be hard - it typically involves an element of feeling awkward. Why is that? And what does it mean for us and our teams? Chances are that at some point in your life your learnt to drive a car. You may have even taught someone else to drive. What does it feel like as the learner heads towards a car for their first lesson. They’re no doubt a little nervous, but are also typically keen to give it a try. Often there’s an assumption that driving a car can’t be that difficult - after all, they’ve seen thousands of others do it every day - how hard can it be? Martin Broadwell described four levels of learning back in 1969, and he referred to this stage as Unconscious Incompetence - the learner doesn’t know what they don’t know. They can’t possibly know how hard it might be to learn to drive a car because they’ve never done it before. The leader needs to invest effort and time in helping the learner at this point, as they’re likely to need really clear directions. So what happens in those first few lessons? No doubt the learner stalls the car, maybe forgets to indicate, or even has a near miss with another car. They might choose the wrong gear or clip the kerb while taking a corner. Their lack of skill in the task is quickly uncovered. But what does that feel like? It feels awful. Every element of driving at this stage takes a lot of thought and planning - knowing where to position the car in the lane, what kind of distance to keep from the car in front, how to translate the images in the mirror to know where other cars are. Broadwell called this Conscious Incompetence - the learner is all too aware of just how much they don’t know, and it often feels awful. Unless there’s sufficient motivation, the learner may even give up at this stage. What the learner needs at this stage is plenty of encouragement to keep on learning. Let’s assume the learner sticks with it. Over the next year they’re likely to become better at driving. Things will become more predictable and in control. They will still need to concentrate on elements of driving, but it will start to feel more comfortable and natural. They need fewer directions from the leader, aside from the occasional new element of encouragement. Broadwell called this stage Conscious Competence - the learner now knows how to do the task, but it still requires quite a lot of conscious thought and effort. And, over time, if the learner driver continues to gain experience and develop their skills, eventually they will reach Unconscious Competence. This is the stage where the skill becomes automatic. Have you ever had that experience of driving somewhere and not remembering much of the trip? That’s likely an example of Unconscious Competence. All the gear changes, lane changes, braking, accelerating, mirror checks and everything else becomes automatic - only exceptional circumstances are likely to require you to use conscious thought and effort. You don’t need much input from the person training you - they have effectively delegated the task to you. The leader needs to adapt their approach to the learner at this stage, otherwise they end up becoming the equivalent of a back seat driver - barking directions at someone who is perfectly capable of doing a great job. While this stage is great as a learner, it can make it hard to then teach someone else that skill. It can be hard to remember what it was like to learn to drive. There can be elements of driving that you find difficult to explain because they’ve become automatic over the years. I remember stepping into my first leadership role. There was so much in the role that was new - motivating others, analysing finances, putting together a business plan, hiring staff, laying off staff - it was almost overwhelming. I was absolutely aware of my short comings and just how much I needed to learn. Fortunately I had people around me who were prepared to invest in my development, and I was also motivated to keep going. But it did lead me at points to question my ability - perhaps I was the wrong person for the job - surely someone else could do this better than I could? And it also challenged me as my team became more and more capable. Was I willing to delegate things entirely? Or did I want to retain some control, just like the back seat driver? Putting ourselves in the position of Conscious Incompetence is a necessary part of growth and development. And helping others through this stage with support and encouragement is critical if we are to retain our best people and keep them motivated. What parts of your role fall in the Conscious Incompetence stage? Are there new challenges on the horizon that might push you back into that zone for some tasks? Where do your team members fall on their various responsibilities? Are there some that require additional support? Do you need to fully delegate to others who are now performing well, and stop back seat driving? How can you use this framework to prepare others for new responsibilities? I hope you found this episode helpful. I’m so grateful for those of you who download the podcast each week and share it with others - it makes a huge difference. Leadership Today is now one of the top leadership podcasts on Spotify, which means even more people are discovering the podcast and working on their leadership. I look forward to speaking with you again next week. Summary Conflict - love it or hate it, you’re going to end up facing conflict at some point. In this episode we discuss some ways of tackling conflict head on. 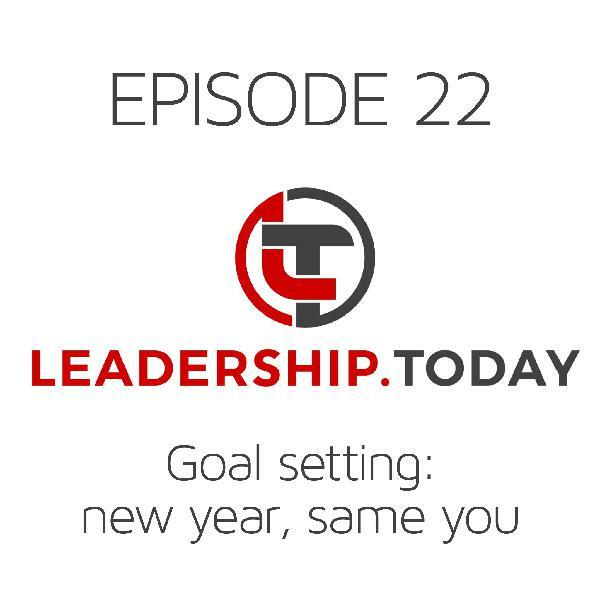 Transcript Hello and welcome to episode 23 of the Leadership Today Podcast where each week we tackle one of today’s biggest leadership challenges. What comes to mind when you hear the word ‘conflict’? When I ask this question on leadership programs, the first things people typically think of are negative. But research suggests that conflict isn’t automatically bad, but neither is it always good. There’s something about the way in which conflict is managed that makes a difference. What is conflict? Conflict occurs where two or more people aren’t thinking alike - where they have differences of opinion, or where their interests don’t align. In this way conflict is the product of diversity - of diverse views, diverse experiences and diverse ways of thinking. We know that diversity, when harnessed and managed, has a broad range of positive impacts on organisational performance. But diversity brings with it conflict which also needs to be managed. Kenneth Thomas and Ralph Kilmann define conflict situations as “those in which the concerns of two people appear to be incompatible.” This definition highlights that in conflict concerns only need to appear to be incompatible - it is entirely possible that with further exploration seemingly incompatible interests may actually be reconciled. How do we approach conflict? We typically approach conflict based on our preferences and previous experiences of conflict. There’s also a cultural overlay, with different cultures varying in how comfortable people are with disagreements. Depending on these factors, when it comes to conflict it’s easy to take an all or nothing approach - to either argue forcefully for our position, or to avoid the conflict altogether. There are times when these approaches can be valid, but those times are the exception rather than the rule. Our goal in managing conflict is to make the most of the diversity - to actively engage in discussion. To refine ideas and improve them by making the most of a diversity of views. And it’s also to build and maintain healthy working relationships. There may be little point winning an argument if it also means losing a key partnership. And of course we want to conclude with a clear way forward. With those goals in mind, here are some tips for tackling conflict head on in a healthy and constructive way: Start with you - why does this issue matter to you? What’s your ultimate goal, not just the initial position you’ve taken? What have been your experiences of conflict in the past? What emotions is this conflict likely to produce in you? Are you prepared to shift your position in the face of additional information? You might consider self-assessments such as the Thomas-Kilmann Conflict Mode Instrument as these can boost awareness of how you typically approach conflict. State your intent - that you want to resolve the conflict and build the relationship. That you want to arrive at a better solution. Also let people know the extent to which you’re willing to change your position based on new information or perspectives. Agree ground rules. Members of a senior leadership team I served on were clear that we wanted to have robust discussions, and that it was okay for not all of us to have the same perspective. But while we didn’t always agree, we made sure we left each meeting on the same page - talking about the final outcome as if we had come up with the approach ourselves, even if we had been arguing against it 20 minutes earlier. You might agree to keep things confidential, to be frank - whatever it might be, discussing ground rules helps. Listen - and really listen - to the other position. Listen to understand rather than just argue back. So often we’re concentrating on only hearing opportunities to disagree and argue back rather than really trying to understand what’s important to the other person, and why it’s important to them. I remember going into a potentially heated conversation with one word written in all capitals at the top of my notepad - that word was LISTEN. Genuinely seeking to understand the other person’s position took all the heat out of the discussion. Shake hands. Whether figuratively or literally but, either way, leave on a positive note. Leaving a disagreement unresolved can lead to it festering and sapping energy. Perhaps the best advice on conflict is the quote from Karl Weick - “Argue like you’re right and listen like you’re wrong.” If you found this podcast helpful, you might also find episode 6 on assertiveness helpful as well - you can find it and all our precious episodes at leadership.today You can also use the connect link there to follow me on LinkedIn, to join our Facebook group, and to receive email updates about new episodes. References Riaz, Muhammad & Junaid, Fatima. (2013). Workplace Conflict: Constructive or Destructive. SSRN Electronic Journal. 10.2139/ssrn.2247886. Reference: Thomas, K. W., and Kilmann, R. H. "An Overview of the Thomas-Kilmann Conflict Mode Instrument (TKI). "Kilmann Diagnostics Website (2009). Episode 23 - Conflict - Ouch! As we prepare for 2019, we're taking the opportunity to replay some of our most popular episodes from 2018. Enjoy! Best of 2018 Replay - Motivation - What's the Point? Summary As the end of the year fast approaches, we take a look at goal setting - something we all know a lot about, and yet we’re lousy at it. Here are four ideas that might help. 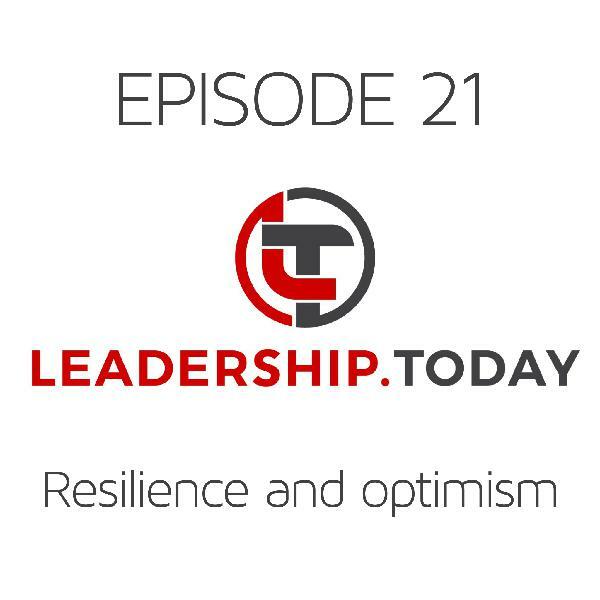 Transcript Welcome to episode 22 of the Leadership Today Podcast where each week we tackle one of today’s biggest leadership challenges. If I was to ask you “Tell me about the best approaches to goal setting?”, you’re pretty likely to mention SMART goals. We all know goals work best when they’re Specific, Measurable, Achievable, Relevant and Time-based. And yet as human beings we are still pretty lousy at setting and following through on goals. Today I want to focus on four quick tips for setting better goals. A few years back I set a goal for myself - I said “I want to become a better cook”. So I dutifully picked up Jamie Oliver’s 15 minute meals book - that sounded pretty achievable. I picked out a meal and got to work. Well, 90 minutes, one fennel and three fry pans later, the meal still didn’t look anything like the photo in the book. Plus I discovered that Jamie hadn’t factored in cleaning up time to the 15 minutes. I gave up. Around the same time I set myself another goal - “I will go for a run every day of the week except Sunday”. Now I had tried running before, even setting a goal to run three times a week. But the inevitable happened - Monday it was a little cold, Tuesday I just wasn’t feeling it, Wednesday there was the sound of rain on the roof - and so on until Saturday. To make up for the lost days I would then run three times as far on Saturday and injure myself, knocking out running for another week. In contrast, my “run every day except Sunday” strategy has held up for over a year. So what made that goal stick, unlike my goal around becoming a better cook? The first difference is word choice - there’s a big difference between “want” and “will”. If you say you want to do something, you’re indicating a preference. If you say you will do something, you’re stating a commitment. Commitments trump preferences any day. Always make sure you express your goal as a “will” statement. Second is the middle part of SMART goal setting - Achievable. This is partly about setting a goal that you think is possible. But it’s also about setting goals that you can actually mark off as complete. The beauty of the “run every day except Sunday” goal is that I either completed it in a particular week, or I didn’t complete it that week. Test the wording of your goal to make sure it is something you can actually mark off as complete. The third key for me was clearly picturing how the process of completing the goal would make me feel. The reality of starting a run on 46 year old knees is not pretty - the first few steps never feel great. But one minute into the run I always feel great, so I focus on that moment as I roll out of bed. And the fourth key is identifying why the goal matters to you. If you set a goal that doesn’t matter to you, just cross it out - you’re never going to achieve it. For me, running is about keeping fit for my family and my work, both of which I love. Running was part of a broader purpose. As you set goals for yourself, remember to say “will” not “want”, make it something you can mark off, picture the benefits of the process, and identify why the goal matters to you. That’s our final Leadership Today Podcast for 2018 before we take a break. We’re on track to sail through 10,000 podcast downloads around about Christmas Day. And I really appreciate the feedback people have provided about the podcast, and for you taking the time to listen. I hope it has been helpful in your leadership development. Over the remainder of December and into January we will be featuring four of our most popular episodes, before we kick off again in February. Best wishes for you and your loved ones for 2019. Summary As leaders, there’s always a risk of blaming people rather than processes. This week we look at a technique that helps us to avoid playing the blame game. TRANSCRIPT Welcome to episode twenty of the Leadership Today podcast. Each week we provide practical advice to address some of today’s biggest leadership challenges. In this episode we’re looking at ways to avoid playing the blame game. As leaders, there’s always a risk of blaming people rather than processes. Something goes wrong and the first thing we want to identify is who is to blame. After all, we’re responsible for the processes, so there’s a built-in desire to protect ourselves by blaming some incompetent or malicious individual rather than our wonderfully crafted systems. Blaming people is a pretty natural way of defending ourselves and maintaining our self esteem. However, it’s not a great way of building trust, getting to the root cause of problems or improving performance. If a leader is constantly blaming their people, you have to wonder - who hired these people, and who has been managing their performance? It’s the same leader who’s now playing the blame game. When leaders play the blame game, it leads to fear, and fear leads to cover ups, and cover ups lead to increased risk. Who would raise a concern when they know there’s a risk of being blamed and all the negative consequences that come with that? The team quickly learn the importance of sweeping things under the carpet. And that seems fine in the short term, until the issues mount up and are impossible to ignore. So, as leaders, it can be helpful to have a technique that allows us to get to the root cause of problems without automatically blaming people. One simple tool is called 5 whys, originally pioneered by Sakichi Toyoda as part of the Toyota Production System. While it was initially conceived as an engineering method, it works equally well on any sort of problem you’re likely to encounter in the workplace. As a result, it has been incorporated into a broad range of continuous improvement methodologies. To use the 5 whys approach, you start with the problem, then look for the preceding cause of the problem by asking ‘why’ - why did the problem occur. The idea being that after you’ve worked backwards by asking ‘why’ five times, you should be at or pretty close to the root cause of the problem. One of the principles is that you can’t have human error as the root cause - instead, you need to focus on the process, not the people. 5 whys is fact driven and logical - it’s about evidence rather than opinions. This takes a lot of the heat out of the approach. Let’s look at an example to bring the 5 whys approach to life. You hang up the phone from a disgruntled customer. They’ve just visited your local store to find their favourite item was out of stock. To make things worse, they had actually called the store the day before to confirm the item would be in stock, and were told new stock was arriving overnight and would be there the next day. Now they’re going to take their business elsewhere. Your natural inclination is to ring the store manager and tell them off for letting the customer down by not keeping enough stock and overpromising to the customer - a classic blame game response. Instead you call the store manager and try to figure out the root cause. Why was the store out of stock? Because the scheduled order hadn’t arrived. Why did the scheduled order not arrive? Because the delivery truck broke down on the way to the store. Why did the delivery truck break down? Because of a broken fan belt. Why did the fan belt break? Because the truck hadn’t been serviced. Why hadn’t the truck been scheduled? Because there wasn’t a schedule in place for truck servicing. The lack of a schedule for servicing our fleet of trucks was the root cause for the stock outage. It turned out the root cause didn’t have anything to do with the store manager - the problem was in an entirely different part of the organisation. The risk now is that we try to track down who is responsible for truck servicing schedules and blame them. Instead, a much more constructive approach is to look at this as a shared problem, and something that can be avoided in the future through continuous improvement. In fact, fixing the truck servicing might help to avoid a whole range of other problems in the future - ones that wouldn’t have been avoided if we had just berated the store manager. Now, 5 whys as a technique is not perfect. For example, it tends to uncover one root cause, when there may be several. And there’s nothing magical about 5 whys - it might only take 3 whys, or perhaps 10 whys to get to the root cause. And sometimes the problem is a person. But the principle of looking at processes and systems first before blaming people is one that any leader can bring to their approach. As leaders, we almost always have great intentions, but our intent isn’t always the same as our impact. In this episode we explore three principles for leaders when thinking about intent versus impact. Transcript Welcome to episode 19 of the Leadership Today podcast - it’s great to have you join us today. I really appreciate those who have taken the time to share, rate and review the podcast. Here at Leadership Today our mission is “Enabling thousands of leaders to achieve results through people”, so it’s great to see the global reach of the podcast continue to grow. Today we’re looking at intent versus impact. As leaders, we almost always have great intentions - our intent is typically positive. However, if you’ve been leading for a while, you will recognise there are times when people might misunderstand your intent - that your intent is not the same as your impact. And that creates problems for us - it leads to miscommunication and can create distrust. Joseph Luft and Harri Ingham were studying group dynamics in the mid 1950s - exploring how we see ourselves versus how others see us. They developed a process that involved individuals choosing words they thought best described themselves from a list of 56 adjectives. Their peers did the same. Not surprisingly, they found that some words overlapped between the individual and their peers and some didn’t. They could then sort each word into one of four quadrants, based on whether a characteristic was known or unknown by the individual, and known or unknown by others. When the words lined up, this meant the characteristics were known to self and known to others - Luft and Ingham described this quadrant as the arena - others have called it public or open. Then you have words people chose for themselves that others didn’t choose - these characteristics were known to self but not others - this quadrant was called hidden, like the person was wearing a mask. Finally, there were words others chose to describe someone that the person didn’t choose for themselves - this is known as a blind spot. It’s also where intent versus impact gets interesting. When there's a misalignment between your intent and impact, you could argue that it’s just others’ perceptions, but those perceptions are their reality whether we agree with them or not. And a blind spot can be positive or negative - you are just as likely to be blind to a strength as you are to be blind to a weakness. When we think about intent versus impact, there are three principles for leaders: If you want people to understand you, make your intent clear If you see people doing strange things, take the time to understand their intent Use feedback to let people know the impact they’re having Let’s look at the first principle - If you want people to understand you, make your intent clear. I was working with a leader who had received some feedback that his team saw his leadership style as highly directive, and almost never coaching. As I worked with him, he just couldn’t understand this feedback - he thought he was coaching his staff all the time. I asked him for an example of how he coached his team, and he said “Well, I coached one of my team members earlier today. I was walking past his desk and noticed he was doing something in Excel in a pretty inefficient way. I knew a much simpler way, so I asked him to move across. I pulled up a seat in front of his computer, and then showed him the easier way. I then suggested he do it that way next time. I coached him.” It was pretty easy to see where the impact of being directive was coming from. I asked him to replay the story, but this time from his team member’s perspective. What would it feel like to have your boss move you to one side then start working on your computer in front of your colleagues? How might the team member have interpreted the situation? He soon saw how his positive intentions could have been taken in a negative way. Even if he had done exactly the same thing, but shared his intent - that is, that he actually thought this team member was doing a great job, and wanted to help him become more efficient so he could go home earlier - the impact would have been entirely different. It’s important to make ourselves known to others, to let them into our head, and to share our intent. This will lead to greater alignment between how others see us and how we see ourselves. Now the second principle - If you see people doing strange things, take the time to understand their intent. Our home used to have vinyl floor tiles in our living room. I walked in one day to find about a square metre of these tiles had been lifted up and placed in a pile by a combination of our three sons. They had managed to get under the edge of one tile, lifting it up, which then gave them access to several other tiles that they could then pull up, and it quickly escalated from there. Several of the tiles had cracked in the process. Now, clearly, I was pretty frustrated by this wanton destruction. It seemed like the kids were trying to vandalise and destroy the house. But I asked them - what were they trying to do? They told me that they were simply trying to build a tower out of the tiles. Understanding their intent helped me to explain their behaviour. It didn’t remove all the frustration, but it did help me to understand why they were doing what they were doing. The same is true in the workplace. People are typically logical and rational in the behaviour - it’s the perceptions of situations that often differ. So when people are doing something strange - failing to get on board with an initiative, focusing on the wrong things, whatever it might be - that the time to explore their intent. Often you will find that it’s actually a miscommunication or misunderstanding that lies at the root of the issue. The third principle is - Use feedback to let people know the impact they’re having. As a leader you’re in a unique position to help others to decrease their blind spots. And I would encourage you to particularly focus on helping people to uncover their strengths. One of the greatest satisfactions I’ve had as a leader is encouraging people to do things that they initially didn’t think they could. I could see strengths in them that they couldn’t see in themselves. Intent versus impact is a powerful way of improving your influencing, understanding others, and helping others to develop. Try these three leadership principles this week and let me know what impact you make.